What is recovery anyway? | The Endo The World? It’s been a year now since my excision surgery, where endometriosis was removed from my ovaries, utererosacaral ligaments, bowel, bladder, pouch of douglas, peritoneum, and diaphragm. Lot’s of people have been asking for an update about how I’m doing, and I realise it has been a while since I wrote about my own condition, so I thought I’d write this post to update you all and to share some of my thoughts managing the surgical ‘recovery’ process. The road to recovery is a long one. There will be obstacles. I give so many different responses to the question ”So how are you now?”, depending on who is asking- I’ve realised that not everybody needs or even deserves to hear the truth. The honest answer to this question is this: I’m doing OK. Not fantastic, not terrible. To clarify, I am certainly MUCH better than I was before my surgery, the difference is remarkable. I now no longer have period pain, which is a huge shock and something I never believed was possible for me, having spent 15 years in agony with every single period. As Mr B and I are trying to conceive, I am off the hormones and painkillers , and am managing well, which would not have been possible a year ago. I am actually enjoying being totally drug free, and am still using holistic and dietary techniques to promote my health, along with exercise, which I am really enjoying. This disease has basically turned my into a hippy. Or Gwyneth Paltrow. I’m OK with that. 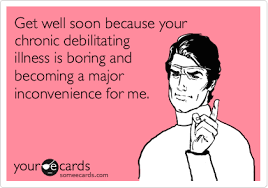 So, as ever when living with chronic illnesses, there are pros and cons, to my current situation, but I am looking on the bright side about how much progress I have made. Thinking about how far I have come since my surgery a year ago, I started to understand that recovery from a major laparoscopy for endometriosis and the journey back to health is a long one- much greater than the couple of weeks they advise you to take off work. In my view this journey can be helped or hindered by two key factors, which I’ve outlined in greater detail below. 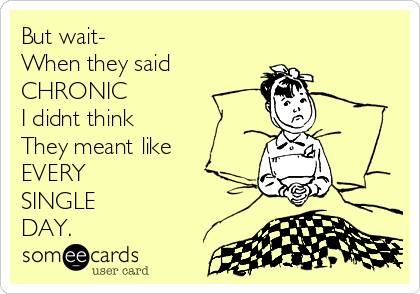 As we all know, there is no cure for endometriosis. While surgery, hormones, or dietary approaches can be useful on their own or in combination, they will not solve the problem completely. When I see other people sharing their stories online, and through my own advocacy work, I have noticed that many put all their hopes onto a particular approach ‘fixing’ them, in the sense of making them feel exactly like they did before they got really sick. This makes me worry that they are setting themselves up for disappointment and failure. I am not immune from this myself, for at least a year after being diagnosed I was desperate to work out how I could get back to being my previous healthy self and carry on as though nothing had happened. Eventually I realised this isn’t feasible, my body has changed and I have changed too much. So I gradually started to alter my mindset to focus on how I can become the best and most healthy version of my my new, chronically ill, self. I’ve found this new approach so liberating and helpful- and it certainly isn’t defeatist if that’s how you’re reading it. It meant that I went into my surgery with positive hopes that it would lessen my symptoms and improve my quality of life, while also being realistic about what it could really achieve in both the short and long term: So when my recovery was hard, and I’ve had flares up, and my endometrioma came back, and my diaphragm hurts, it was disappointed for sure, but I wasn’t crushed like I used to be. This new approach to my thinking has also encouraged me to keep striving for health through diet and exercise etc, rather than feeling demotivated and giving up on myself because things will never be as they once were. Family member: It’s disappointing you’re still experiencing some these problems isn’t it?! Friend: How come you’re still feeling bad- do you need another surgery? Boss: What do you mean you still have fatigue? I thought you had surgery to sort these things out! Even though I have told people that endometriosis is a chronic and incurable condition, the fact is most people are much more familiar with acute illnesses that get better with treatment, and they will fall back on these experiences to make sense of what you’ve been going through. I mean, people have surgery to fix them right?! I think if and when I have another laparoscopy, I will work to reinforce realistic expectations of my friends, family, and colleagues during and after the procedure, to improve their understanding and to limit these comments. Well informed people makes much better cheer-leaders. When people expect that you’re going to be well, or improved, or cured, it is really very difficult to confide in them that your not, and this can increase feelings of loneliness and isolation. It feels like you’re somehow disappointing them or simply not trying hard enough to get better. There were a few months after my surgery when I felt frustrated with my progress (well, my perceived lack of) and felt like I was just drifting aimlessly through life without any vision for myself or support. This was really weird for me as I’ve also been a planner and had a strong sense of where I wanted to be. My self confidence was in tatters, as was with fitness and progress on my PhD. What has really helped to turn this around has been having specific and realistic goals to work towards with regards to my recovery and general health. Over the past year these goals have included: Working on getting leaner, improving my stamina, working to reduce the inflammation in my body, getting pregnant, and finishing my PhD. The joy of goals is they can be adapted over time depending on your needs and vision for yourself, and they help to develop your sense of purpose and self worth. Without them, the journey to recovery can feel like a never ending road to nowhere. I would recommend making some short term goals immediately after surgery for the following weeks, and then introducing long terms ones gradually in the months afterwards. The key to success with such an approach is making sure the goals you set are realistic, and that you can identify the steps you are going to take in order to achieve them. 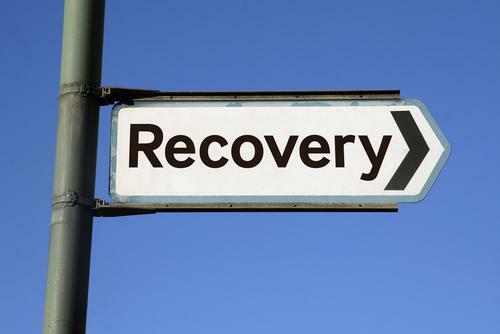 So what exactly recovery is, and to what extent it is possible, I still don’t really know. It’s certainly more than physical healing from surgery and is an ongoing process requiring lost of thought and practice. Like everyone else, I am just trying to do my best in difficult circumstances, and trying to make positive decisions that are right for me. If you’re feeling lost, or discouraged, on your road to better health, take heart, and take one day at a time. We will get there in the end. I hope these thoughts are useful to those of you who have had or will be having endometriosis surgery. I would love to know if you have any other tips for aiding recovery and health! And what goals you have for yourself despite endometriosis/chronic illness. ← I featured on ITV’s ‘This Morning’ to discuss period pain and menstrual leave.